Buying local: does it make a difference? Aveda's main facility in Tokyo, the "Lifestyle Salon and Spa"
For U.S. companies hoping to sell their products abroad, there are some basic do's and don'ts. For example, DO try to stand out as more than just another foreign company. DON'T stand out as the company that insults the local culture. It sounds simple, but international marketing is delicate business. We look at one recent snafu, and one Minnesota success story. St. Paul and Blaine, Minn. — Late last year, Oregon-based Nike released an ad called "Chamber of Fear" on Chinese television. Nike hoped to cash in on basketball fever in China, featuring NBA star LeBron James running a gauntlet of animated opponents. To most American eyes, the ad is pure fun -- a visual feast. To some Chinese, it was a parade of insults. "Within China it has generated a lot of commotion," says Jamal Al-Khatib, a professor of international marketing at the University of St. Thomas in St. Paul. He sees the Nike ad as a great cautionary tale for his field. It starts with James bouncing a basketball off the face of a kung fu master. Later, he takes on two dragons spewing ghostly ball players from their nostrils. "The dragon is a very sacred element of the Chinese culture. And you are attacking it -- you are defeating that symbol," Al-Khatib says. "Another issue I saw is LeBron James defeating two females, which is culturally inappropriate." The Chinese government banned the ad in December for not "upholding national dignity...and respecting the motherland's culture." Nike apologized, saying it intended to inspire rather than insult. Al-Khatib says the ad has damaged more than just Nike, by encouraging the government to more closely monitor ads before they go on the air. Al-Khatib says in 2005, companies' logistical ability to make products and distribute them globally may be advanced. But in an era when U.S.-based ad agencies still account for around half the world's ad spending, the ability to communicate in other cultures isn't always keeping up. "You go manufacture in China, that's not as complicated as dealing with social norms, with cultural values, with history, with religion," Al-Khatib says. Successful marketing also means adapting your product line to suit local needs and wants. On that count, one Minnesota company has been hitting many of the *right* notes in its first leap into a foreign market. Aveda is a household name in the U.S. Eighteen months ago, the hair and skin care company set out to replicate that success in Japan. 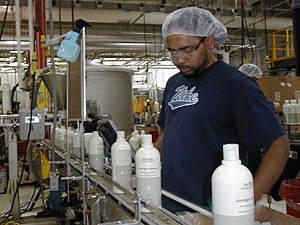 At the Aveda factory in Blaine, bottles of a product called "Damage Remedy" roll off the line. This is one of a half-dozen Aveda products newly developed or significantly modified for the Japanese market. Spokeswoman Vicky Melen points out that "a majority of Asian women feel that their hair is damaged, so they need a treatment product. So we created something for Japan." You can find Aveda in a number of other countries. But Japan has been Aveda's first coordinated, deliberate attempt to gain a foothold in a major foreign market. Aveda President Dominique Conseil says the huge consumer market is tempting, and its western veneer might seem easy to crack. The truth is that Japan's extremely particular consumers have sent many of Aveda's competitors packing. "We knew it would be very difficult," Conseil says. "Most foreign companies have a hard time, and do not make it. If they do make it, they lose money for some time." The launch of Aveda in Japan followed more than three years of research and preparation. "For the Japan market, you cannot make an error," says Peter Matravers, Aveda's head of research and development. "Everything needs to be beyond perfect. You need to give them more than you've promised." Aveda has some things already going for it. Some Japanese had discovered Aveda during trips abroad, and the products sold well with Japanese tourists in Hawaii. What's more, Aveda's reputation for using natural ingredients has a certain instinctive appeal in Japan. Aveda's "greenness" fits well in a part of the world where herbal health remedies are common. "These ideas, which are now cool in the West, they are obvious to Japanese people," says Conseil. "We don't have to explain that to them. They know it better than we do. So these are things in Aveda that work for us and make us immediately accepted." But greenness, it turned out, could also be a liability. Roxana Daver, Aveda's top official in Tokyo, says the company learned something troubling over many hours of Japanese focus groups. "We found that the perception of products with natural ingredients was that they were nice to use and made you feel good, but that they didn't really have results," Daver says. For the Japan market, you cannot make an error. Everything needs to be beyond perfect. You need to give them more than you've promised. This is an information problem. Rather than use a major ad campaign to explain how and why its products work, Aveda went a different route. The company carefully cultivated a relationship with the press in Japan, which gave the company credibility with stories about its research and product line. To hear Conseil tell it, the Japanese media have been one of Aveda's best assets. "No introduction can happen if the press doesn't support you. We can do a salon, we can set up a good distribution system, but the brand will be made by the press," Conseil says. Aveda focus groups revealed yet another challenge -- one that strikes at the heart of the company's identity. R&D head Peter Matravers says many Japanese wrinkled their noses at the powerful, unfamiliar waft of eucalyptus, coriander, and other ingredients that are unmistakably Aveda. "Most of them perceived not only the aroma to be different, but they also perceived it to be too strong, too high of a level," says Matravers. The Japanese, it turns out, simply do not like strong scents. But Matravers says Aveda couldn't just drop one of the distinctive qualities of the brand. "Certainly we would not want to change the type of aroma, or change the science of Aveda's aroma," he says. "But we need to adjust the intensity to make them feel more comfortable." R&D was also at work making other changes for Japan. Aveda's entire product line was developed with Caucasian hair in mind. But Asian hair is both thicker in diameter and more dense. Aveda conditioners weren't powerful enough. At the same time, Japanese in focus groups disliked the feeling of anything weighing on their hair after use. The company had to reconcile these somewhat divergent goals into a single product line. One of the results -- a line called "Light Elements" -- is now set for distribution in the U.S. as well. Another product for Japan took Aveda into completely new territory. To compete as a skin care line, Aveda would need some sort of "skin whitening" product. Matravers says Japanese women put a lot of energy and money into making their skin lighter than it naturally is. "Japanese look at whitening as part of their ritual," Matravers says. "It is perceived to be elegant to be more pale. I think it also speaks to how they see beauty." Because skin whiteners affect the pigment found in skin cells, the Japanese government regulates them as a drug. Aveda eventually found an effective formula that was both all natural and met regulatory approval. Aveda has decided to sell products in Japan only through hand-picked, professional salons. The idea there is to reinforce the reputation for quality, though there may be some immediate price in terms of name recognition. A spot check of a recent flight headed from Minneapolis to Tokyo found young Japanese women puzzled when presented with a small shampoo bottle and asked if they recognized the brand (which in Japanese is pronounced more like "AH-beh-da"). Aveda President Dominique Conseil says he intends for Aveda to achieve the same name recognition in Japan it now enjoys here. Along the way, he hopes Aveda's success will introduce a new word into the lexicon of international business: "Glocal-ism." "In my mind, the global company is the big international monster that exports everything from a home market, the one-size-fits-all approach," Conseil says. "The 'glocal' company is the company that listens, so that the company can become intelligently international." It may be some time before business people around the world are using Conseil's word. They may, however, be using Aveda.